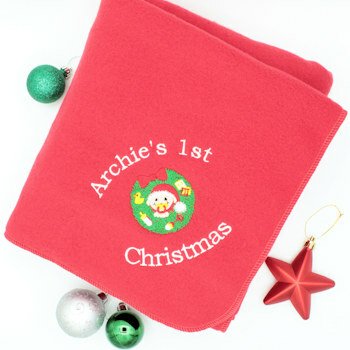 Personalised Baby's First Christmas Fleece Blanket. Personalised Baby's First Christmas Fleece Blanket. A special once in a lifetime gift made just for baby on their very first Christmas. Custom made in the UK lovely quality antipil soft polar fleece baby blanket with embroidered baby wreath Christmas motif and name. Baby pram size fleece blanket at 75 x 100cm. Blanket has an overcast blanket stitch edge in a matching thread colour to the blanket. For the embroidered text we replace the word Baby's with a name ie; Jenna's 1st Christmas. Choose the letter font style and blanket colour you prefer.